First off, my Christmas gifts, post-Christmas orders, all of it is hitting January 2017. So this month is heavy-spending one for sure, and I went a little crazy. Lots of Lularoe piece from different sellers! That said, it's also a fresh year and a fresh budget. As mentioned in last month's post, I decided $2500 is a reasonable annual budget for me this year. 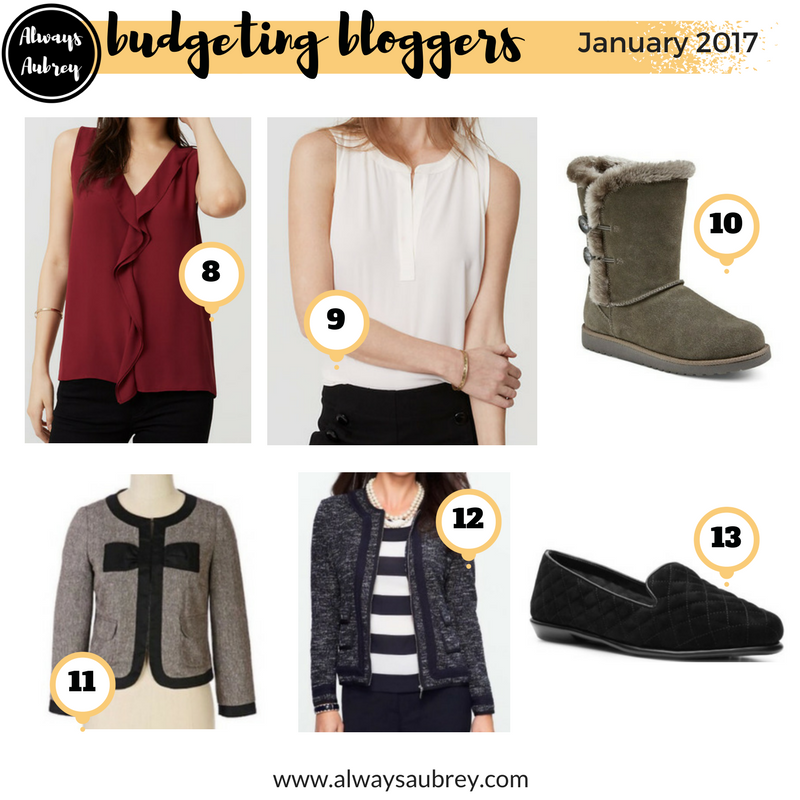 Link up monthly with the rest of Franish's budgeting bloggers for accountability and sharing! 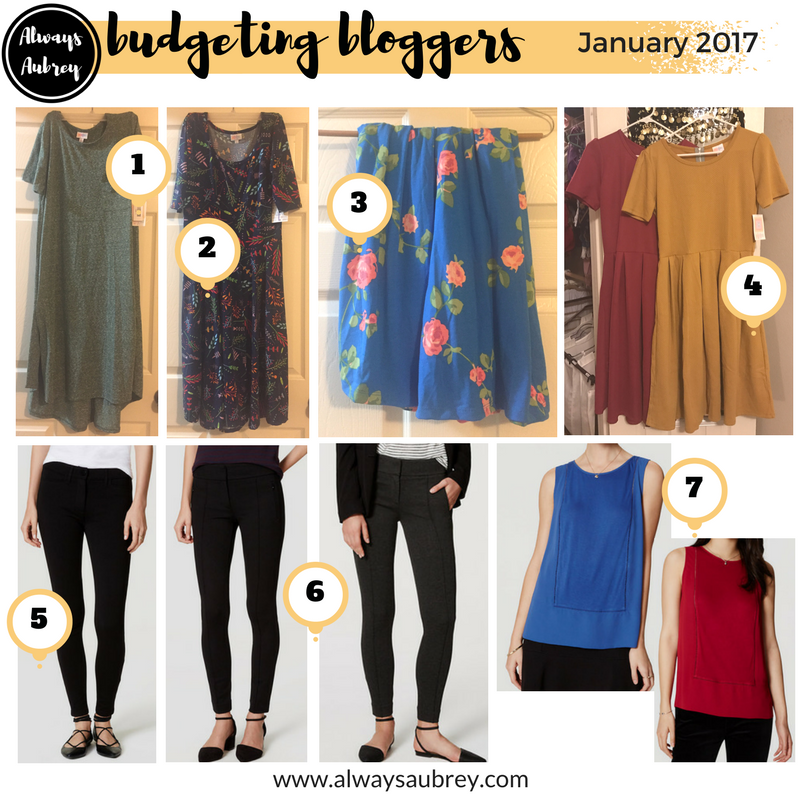 I love seeing what other bloggers are shopping. Lularoe Carly Dress ($55): The Carly is a high-low trapeze dress of sorts. I wasn't sure I'd like it, but the green heather one I got works perfectly for weekends. It's long enough I can wear it without leggings if I want to, and it's very comfortable. I could belt it probably. Not my new favorite given the price, but it's a different silhouette that I'm trying! Dan liked it. Lularoe Nicole Dress ($48): I didn't know if I'd like the Nicole as much as the Amelia (my favorite LLR dress), but given it is $17 cheaper, I decided to give it a try. It's definitely a flattering cut, and I think that I'll buy more in the future if the print isn't available in Amelia. Amelia still wins for adorable tailoring and pockets, but Nicole is my #2 LLR dress now. Lularoe Madison Skirt ($46): I couldn't resist the floral for spring and summer. I think I'll wear it with my mustard tops and cardigans for an obnoxiously bright weekend outfit. Lularoe Amelia Dresses ($65): I bought two of my favorite LLR dress from a different seller than the ones above, because they had my favorite color (mustard yellow) and a darker maroon shade. They have texture but are solid colors, which is perfection. Couldn't resist, I'd been looking for that yellow color! LOFT Ponte Five Pocket Leggings in black (originally $70, paid $35) I wear black ponte pants to work almost every day, and getting a pair for under $40 is a bargain. So I stocked up, especially since the pants I used to buy at The Limited are gone with the closing of that store! LOFT Zip Pocket Pintucked Ponte Leggings in grey and black (originally $70, paid $35 each): See above. NEED ALL THE PANTS! LOFT Paneled Mixed Media Shell in vibrant cranberry and ocean sapphire (originally $40, paid $18): I wear a lot of cardigans and blazers, so I need shells or tanks to wear under them and coordinate. I used to just buy these at Forever 21, but the quality was lacking. So I used a great LOFT post-Christmas sale to snag a bunch. I've already been wearing them. 9. LOFT Mixed Media Split Neck Shell in whisper white (originally $40, paid $20): This one feels like a blouse in front, and a soft t-shirt in the back! 10. Target Kamar Shearling Style Boots in grey (originally $35, paid $25 on sale): These are now even cheaper on sale, but I wanted some comfy boots like Uggs. Now I want some in a tan color, in a taller height perhaps. Maybe I'll hold out for post-winter Uggs sales. 11. Anthropologie Bow Jacket similar, similar splurge (new $119, paid $45 with shipping via Poshmark): I have been looking for tweed jackets to wear for work and DAR events, and I found a couple of nice ones used on Poshmark. 12. Talbots Prospect Tweed Nautical Jacket similar (new $94, paid $23 via Poshmark): I used a $5 credit on this one, and it was a steal. 13. Aerosoles Solid Bet Loafer via DSW (originally $50, paid $40 with DSW rewards): The MOST COMFY LOAFER EVER. If I could buy these in a zillion colors, I'd livein them forever. Has anyone seen a good deal on soft, ponte knit blazers? I feel like mine are starting to pill. So while I'm gonna attack them with a lint/pill shaver (one of the best inventions ever), I might want to start looking for replacements or new colors. Here's what I got for Christmas by way of closet additions, not pictured, but listed!